Charlotte Ninon Coleman (3 April 1968 – 14 November 2001) was an English actress best known for playing Scarlett in the film Four Weddings and a Funeral, Jess in the television drama Oranges Are Not the Only Fruit, and her childhood roles of Sue in Worzel Gummidge and the character Marmalade Atkins. Coleman died of an acute asthma attack in Holloway, North London, aged 33. Coleman was the first of two daughters born to actress Ann Beach and Canadian-born television producer Francis Coleman. 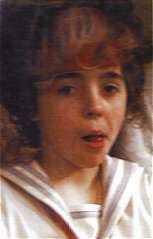 Her younger sister is the actress Lisa Coleman. She was educated at Camden School for Girls, from which she was expelled. Outside regular school hours she attended classes at the Anna Scher Theatre School in Islington, north London, because she said she was "too cool" to go to the Brownies. At 15, feeling that her upbringing had been too liberal – her parents "didn't believe in restraint" – Coleman enrolled at Dartington Hall School in Devon. It was a very progressive school where pupils "didn't have to go to any lessons, so I didn't. I spent 15 grand – all my money – and it was just stupid really." After this, she attended cookery school. Coleman's first major television role was as Sue in Southern Television's Worzel Gummidge. This ran for four series (and a Christmas special) from 1978 to 1981 on the ITV network. Other early work included A Choice of Evils (Play for Today, BBC, 1977) and Two People (LWT, 1979), as Emma Moffatt). She had a crush on Stephen Garlick, her co-star in Two People. For the role, she had to choose a stuffed toy for Emma to carry; she named it "Haggis" and still had it when interviewed in 1990. This was soon followed by her role as the teenage rebel Marmalade Atkins, firstly in Marmalade Atkins in Space (a one-off drama shown in 1981), and then in two series, Educating Marmalade (1982–83) and Danger: Marmalade at Work (1984). All three were made by Thames and written by Andrew Davies. In 1990, Coleman appeared as Jess, a girl from Lancashire brought up by a strict Pentecostal mother, in the acclaimed BBC television drama Oranges Are Not the Only Fruit, based on Jeanette Winterson's novel of the same name. Coleman won a Royal Television Society, Best Actress award and was nominated for a BAFTA for her portrayal of the young lesbian character. She also read the novel for release by BBC Audiobooks. Other television appearances in the 1980s and '90s included roles in The Bill and Inspector Morse, the short-lived comedy series Freddie and Max, with Anne Bancroft, a drama about homelessness, Sweet Nothing and, another lesbian role, as Barb Gale in the political satire Giving Tongue (1996). She also appeared in Simon Nye's sitcom How Do You Want Me? (1998–2000), alongside Dylan Moran and voiced the lead female character, Primrose, in the animated adaptation of Brambly Hedge. Coleman's final television appearance was in the adaptation of Jacqueline Wilson's Double Act, where she played the twins' teacher, Miss Debenham. Probably Charlotte's most internationally known role was as the endearingly kooky Scarlett in the film Four Weddings and a Funeral (1994) with Hugh Grant, Simon Callow and Kristin Scott Thomas. She continued to act steadily throughout the rest of the 1990s in films, with her last major film being Jasmin Dizdar's Beautiful People (1999), set in London in 1993, at the time of the Bosnian War, playing the role of Portia Thornton. Coleman portrayed the character of Lorna in Our Own Kind (Roy MacGregor), at the Bush Theatre in London (April 1991). She co-starred with Kevin Whately, Nisha Nayar and Jane Horrocks. "The prime focus falls on Sylvie's bright-eyed schoolgirl sister Lorna. Vividly brought to life by Charlotte Coleman, she's both a droll chorus figure and an optimistic, surrogate victim. The play is tightly directed by new Bush supremo Dominic Dromgoole"
In 1987 Coleman's then boyfriend Jonathan Laycock died as the result of a cycling accident; he was 23 years old. After his death Coleman went through periods of depression, and developed the eating disorders anorexia and bulimia; she also attended AA meetings because "she couldn't bear being with all those fat people at Overeaters Anonymous". On 13 November 2001 she visited her family where they watched a video together. Her father later stated that she had been in great spirits, because of her new flat in Holloway, north London, which she had decorated, and there was a possibility of a career upturn after a few years of a career stall. Later that evening, she complained of feeling unwell, but went home to her flat against her parents' advice. The next morning, Wednesday, 14 November 2001, her parents telephoned her to see if she was feeling better; but there was no reply. Concerned, her mother went to Charlotte's flat, to find her lying unconscious on the floor; her asthma inhaler was in a different room. She was taken by ambulance to Whittington Hospital in north London, where she was pronounced dead on arrival, from a massive attack of bronchial asthma. A memorial was held at the Mill Hill Buddhist Centre in north London later that month, attended by family and close friends. The New London Performing Arts Centre introduced the Charlotte Coleman Scholarship in 2003. A showcase event is held every November from which one performer is chosen to receive the award. All NLPAC members are eligible for the prize of a year's classes in dance, drama and music. ↑ "Four Weddings star dies". Daily Mail Online. Retrieved 2014-10-23. ↑ Reynolds, Nigel (2001-11-17). "Four Weddings actress Charlotte is dead at 33". Telegraph. Retrieved 2014-03-17. ↑ Thaxter, John, Richmond & Twickenham Times, 12 April 1991. 1 2 3 4 Gannon, Louise (13 August 2002). "Bulimia, drugs and a secret tragedy. Why Four Weddings' Charlotte Coleman really died at just 33". Daily Mail: 24–25. 1 2 3 4 Gannon, Louise (September 2002). "Why did Charlotte Coleman die?". Elle: 175–176, 179–180.